Smartphones have a much shorter battery life than in the good old days when you’d get a week out of your Nokia. These are several ways to explain this. That big, beautiful screen you stare at consumes battery for breakfast, lunch, and dinner. All the data that you are beaming back to Google, your GPS and the more complex software that is running inside your pocket is all energy hungry. However, there are ways of saving valuable percentage points here and there that could make the difference between needing a charge or not. 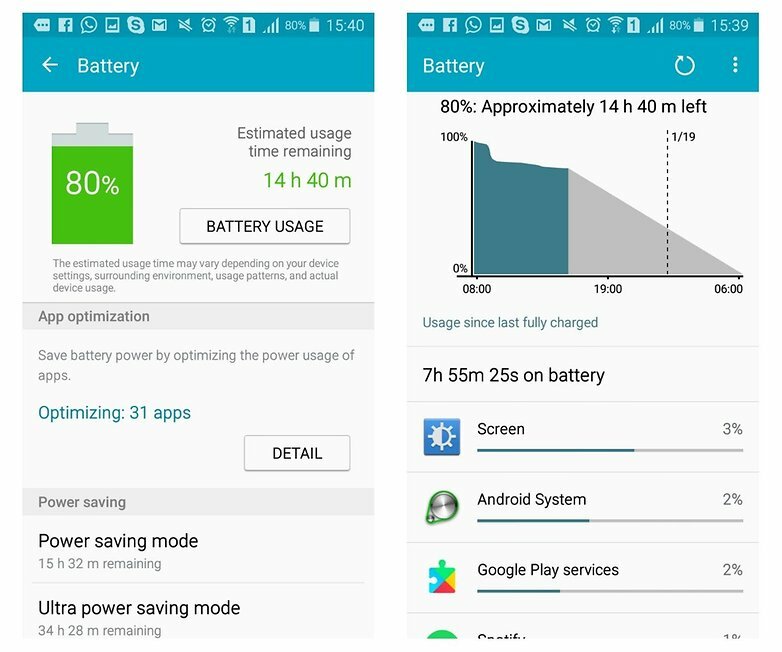 In this article, we’ll identify the problems that can arise with Google Play Services, go through the most common battery burners, and the actions you can take to put the brakes on them. An ounce of prevention is worth a pound of cure, as the saying goes. Smartphones batteries degrade over time, but you can prolong its life with a little bit of TLC. To show your smartphone battery some love, follow these three simple rules. Always use the charger from the manufacturer that came boxed with your smartphone if possible. Try to keep your battery somewhere between 32 and 80 percent. If you follow good practice and still get battery problems, then it’s time to investigate whether Google Play Services is the culprit. What is Google Play Services? Google Play Services is install by default on all Android smartphone, and plays a quiet but important role in the all the operations of your device. This powerful app gets regular updates, and requires a large number of permissions, but it isn’t an app that you can open and use. Instead, it’s an API package that manages updates for Google apps (Gmail, Maps, Google Play, etc). Fantastically useful, this far reaching app also has the potential to be a battery killer when not operating properly. The reason why Google Play Services could be the culprit is because for many apps it’s the key to the world of Google: it delivers your Gmail to mail apps, maps and location settings to mapping apps, ads to ad-based apps and so on. If your trusty phone is suddenly suffering from a terrible battery life, the culprit could be Google Play Services. Batteries do deteriorate over time, but it’s a gradual process: unless you’re spectacularly unlucky, a battery that was OK yesterday won’t suddenly discharge three times faster tomorrow. The easy way to tell whether Google Play Services is draining the battery of your device is to pop into the Battery section of your Settings app. As you can see below on the left screenshot, just tap on Battery usage. This shows you the biggest power hogs, and in most cases, you should see the Screen listed at number one, which makes sense, given that it’s the most power-hungry part of your device. If Google Play Services is using more power than the display or more power than the Android system itself, something’s wrong. In the below screenshot on the right, you can see the list of power hogs. There are a number of reasons why it might be using more power than you’d like. We’ve seen reports of the app eating battery life across Android versions from KitKat to Oreo, and also on devices running CyanogenMod or OxygenOS. With so much variety there clearly isn’t a single solution to solve every problem on every device. But there are some things you can check. As with any problem, we’re assuming you’ve already tried rebooting and that you have the most up-to-date software and firmware for your phone. If you haven’t, do those things first. They solve all kinds of issues. Is your Google Play Services up to date? Now, this might sound counter-intuitive, especially if you started noticing that battery drain after a Google Play Services OTA update, but sometimes you just need to accelerate through your Play Services versions to fix the problem. Here’s how to keep your Google Play Services up-to-date. If the latest OTA version is causing trouble then it’s worth checking to see if there is a new beta version available. Back in November, Pixel and OnePlus users were able to stop the battery drain issue by installing the latest beta version of Google Play Services. Is it draining your battery because you have loads of accounts? Play Services’ main job is to download things in the background. Those things could be your emails or the app’s ads, or notifications or checking your location to see if it needs to trigger a Google Now event. If your device is connected to multiple Google Accounts, for example, because you have personal and work accounts or because you’re a spy or superhero with multiple identities, then Google Play Services is having to do all that for multiple accounts. Is a third party app misusing Google Play Services? If the battery drain is a recent development the problem might not be with Google Play Services but with one of the apps that use it. Try booting into Safe Mode; if your battery problem goes away that’s a pretty big hint that the Google Play Services battery problem is down to a third party app. Is Google encountering Sync errors? Sync errors are when Google tries to synchronize data but can’t, for example, because it can’t connect to a particular server. Problems with your data can also cause sync errors, so for example, if something’s gone wrong with your contacts, calendar or Gmail that can cause Google to keep trying (and failing) to synchronize your local data with Google’s servers. Removing and re-adding accounts can solve persistent sync errors but before you do that, try disabling Mobile Data in Settings for a minute and then turning it back on again. When an app needs your location, it requests it through Google Play Services, which gets the information by using your GPS hardware. If you weren’t aware, using GPS takes up a lot of battery, and since Google Play Services facilitates this process, it can appear to be taking up the battery life when the GPS is really the culprit. In the Battery usage screen, we showed you how to get to before, tap on Google Play Services. On the detailed screen, it shows you. Scroll down until you see Location and tap it (like in the left screenshot below). You’ll then find three mode options, one of which is called Power Saving. 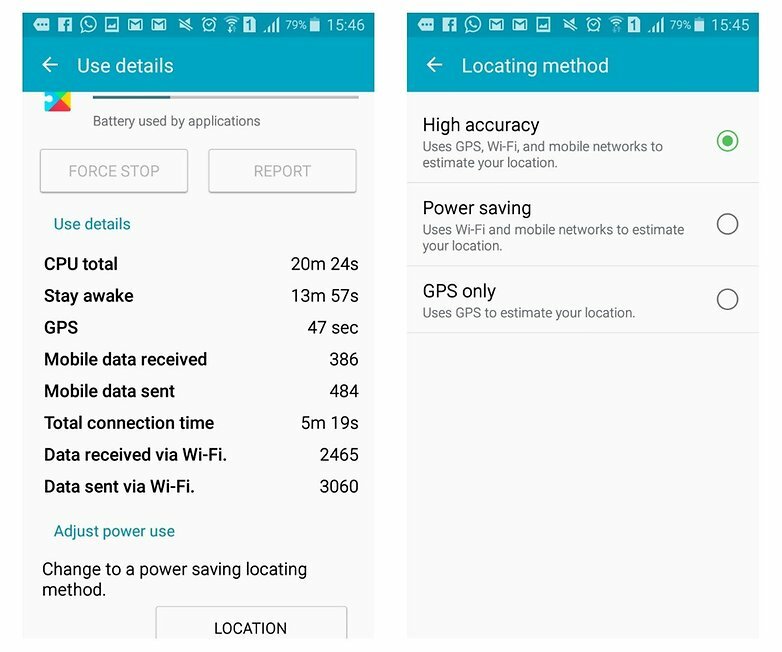 This mode doesn’t use GPS to retrieve your location, and is less accurate, but can save your battery life by only using your network and Wi-Fi information. If you find this setting to be too imprecise, simply switch it back to High accuracy later. Are emojis giving Google a sad face? This is an odd one we know, but some users have reported sync errors when using emojis in contact names: Google doesn’t like that, and it can stuff the synchronization process. Are you using too many battery-killing apps? Task killers are supposed to disable unwanted processes, and they do – but sometimes the result of killing a task is that it immediately starts back up again, so you end up making your phone work even harder than before. That’s an easy one to check: try disabling your task killer and see what effect it has on battery life. Are you running security software? Security software has an effect on battery life because it’s always on. Like Windows, the threat of malware on Android is blown out of proportion: if you don’t download from dodgy app stores and don’t open unexpected attachments, the risk of infection is very small. As with the task killer, try disabling your security software and see what happens. As you may have already noticed in the consumption screenshots above, the display is one of the biggest power consumers on a smartphone. You can, however, reduce the amount of juice needed to power it by reducing the brightness. A lot of phones these days have an auto setting, but for the best result, you should just alter it by yourself. for maximum battery optimization, keep the screen as low as you can whilst keeping it usable. You will need to use a higher setting during daylight hours, but you should never need to have it on max brightness. 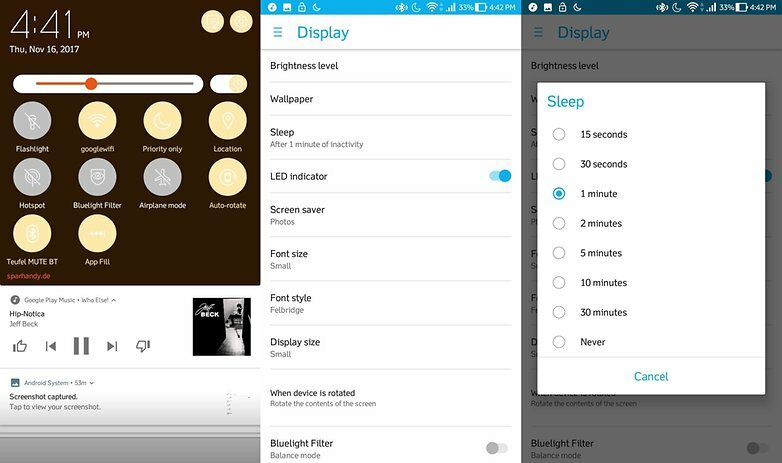 if you are running into an issue with certain apps taking over your brightness or keeping your screen on for too long a time, you can download Caffeine. It will override the display settings for certain apps. The Play Store is jam-packed with apps that promise to extend your battery life. We would always recommend you on board resources over these third-party solutions. Huawei, Sony, and Asus, among other manufacturers, provide a range of power-saving modes and optimization tools that can really make a difference thanks to their integrations as system apps. Finally, when you have optimized all you can and you are still not getting enough battery life, it might be time to start looking at investing in a Powerbank. these mobile chargers can provide your phone with extra power several times before they need to be re-charged. Sure, it is a pain to carry around an extra brick in your bag, but for those times when you really need to top up your battery, they can be lifesavers. Have you encountered these issues? Have you been able to fix them? Let us know below.